Hi everyone, back from a lovely holiday and trying to get my head round some new designs. I needed to do a quick card today and came up with this topper. The photo hasn't come out well as it is very overcast here today. If you would like the topper you can download it from the links below but please leave a comment if you do. Oh! 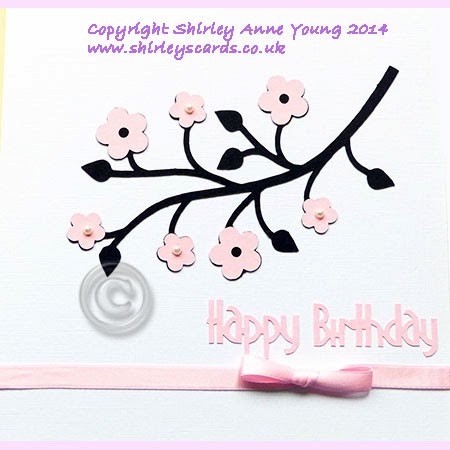 Shirley, you read my mind LOL, I was going to buy a diecut like this, don't need to now LOL. Thank you for the lovely spring floral branch. It will get a lot of use. Your files always cut so beautifully. Welcome home with another wonderful Freebie. I had thought of buying a die for small flowers like these and now you have come up with the goods I do not have to. Thanks - love cherry blossoms! I am happy you had a good holiday Shirley! Thank you for this wonderful cut file. I will dream of Spring when I cut it! Very pretty. Thank you so much for sharing. Beautiful freebie, will use a lot. Many thanks. Another wonderful freebie, Many thanks. Another great template. Many thanks for sharing. Another generous freebie, it's gorgeous. Thanks Shirley.